You do a lot for your customers. I hope you do. 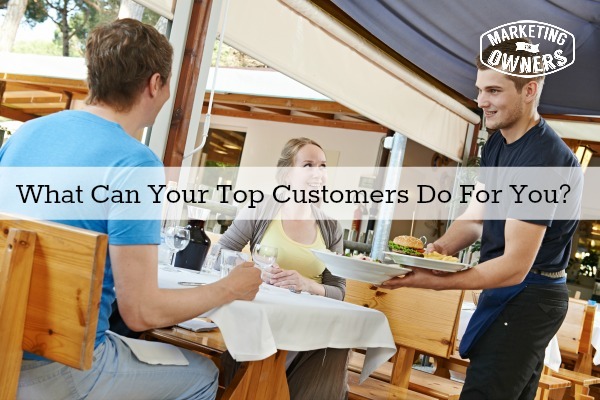 So, what can your customers do for you? They can help you build your business. They can help you target your products and services to them. They can make your business easier. And, how do we do that? We have to talk to them. I have said it before. There’s all sorts of ways, but it’s going to be via a survey. So, let me give you a different way of looking at it. Because when we think of surveys, if you are like me, you are thinking of that phone call you got. When you sat down for dinner the other day, suddenly the phone rang and you answered it and it was a phone or a utility company that said, “We found you from this list and we like to improve our services and if you just got 15 minutes just ask,” Really? In today’s world. that’s not going to cut it. That’s not what we are talking about. I want you to figure out who your top 10 customers are. Now, only you can do this. You can decide it in any way you like. You might only have 20 customers, so it should be easy. You might have thousands like we do at Fire Protection Online. It’s not so easy. So perhaps, we want to look through and see who buys most often, who are the repeat customers, who are our top ones. You can decide who, in other words, who is worth listening to. So, have they bought from you over a long period of time? Do they consistently buy? Do they make comments? That’s the type you want and this is going to be your weekend challenge by the way. 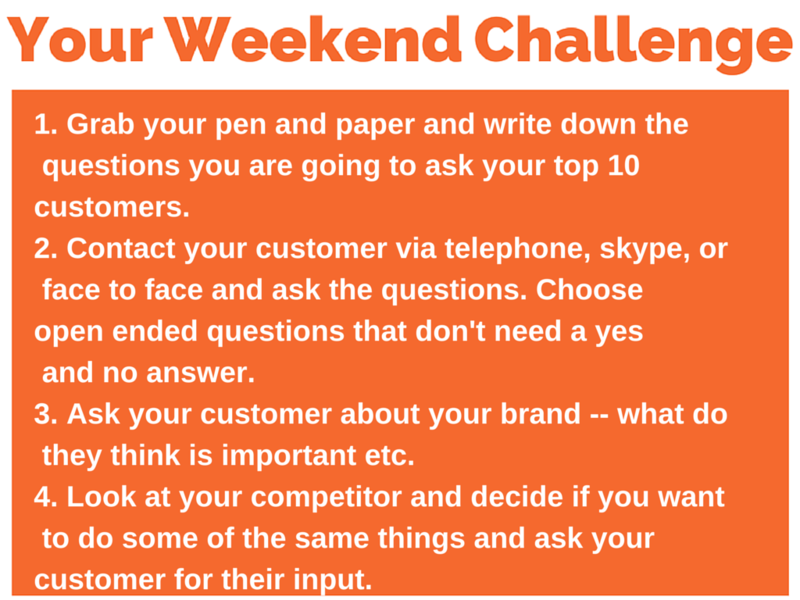 1. grab your pen and paper write down the questions that you are going to ask those top 10 customers. You can do this via Google Forms using a survey (which is free), or via SurveyMonkey and that also has a free level, which should be adequate. You can do it. You can send this out to the masses, but, I still want you to personally speak to them one on one, preferably face to face. Pop in and ask the questions. Give them a little overboard for taking the time out. Maybe even invite them out for coffee. You will be surprised. Maybe even invite them out for lunch. I don’t know how you much you spend with you, but you will be amazed at what this does for relationships. Yes. 2. Contact your customer via skype, telephone, or face to face and ask them questions. Choose open ended questions that don’t require a yes or no answer. In this survey, you do not need to know the name or age or any of that. You can, if you really want to, but leave it to the end because they are not going to be very interested if you start off with boring bits. 3. Ask your customer about your brand, what they feel is important. So, you need questions that are going to further your business. Now, you don’t want to know sort of on a 1 to 5 ratio. You don’t want them to rate your service. Be very honest. Ask questions about competitors. So for example, ask them. Give them a list of things that you do that you think are really top selling points and give them a little grade or a 1 to 5 with 5 being the highest of how important these are to you. So for instance, you may sell products. In one of our surveys once, one of the questions we asked is how important our brand names that we used to use in our advertising was. so I needed to find the top brands in our fire protection company. No one cared pretty much. It came very light. I was very surprised. That’s what people want quality and more. I did want quality, but the brand name where it came from meant nothing to them. So, we dropped that from our advertising. Didn’t make any difference when we changed our approach. So, ask questions, the things you think are important. 4. Look at your competitor and decide if you want to do some of the same things and ask your customer for input. Up to that point, you are guessing. Get questions that get some engagement from customers. Do not make them boring. Really get to the nitty-gritty. So, when you ask your question, write it down. Look at that question. Think to yourself. The answers I’m likely to get are_______ and will these answers help me with my business? So, if that’s not going to be right, reword your question and do it again. Now, make sure you don’t have too many. Because if you keep it short and sweet, then you can do it again. Now, at the end, this is a very important, you need to ask them a question, an open ended question that will get an answer in their own words, or perhaps you could ask two. Something like that. Now, people will come out with outrageous things that they might, for a laugh, they might say, “Free iPad to play with.” Then, you might think great. But, what happened, if out of the 10, what if the 6 said, “Free iPad to play with while we’re waiting in your waiting room,” do you think that would be worth considering? Of course, I just plot that one to ask. Then, why don’t you want to have to buy iPads? But, what is going to be important here is that people will use the language that they use, not the language you use and they will phrase things in a different way. What is your utmost priority? What problem can we, do you think we can solve?” Again, people will speak in their own words. You’ll find some consistency and you’ll be able to use those words in your advertising, in your copywriting, in your website, in your headlines, etc. This is all good stuff. Please do it. 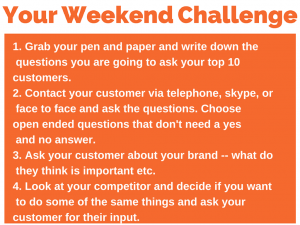 That is your weekend challenge. You will learn things. And by the way, when you do learn, take action with it. You are getting more focused, more customer oriented, more targeted. You are building a wonderful business. And, I love it.